China may have just hit 1 billion mobile subscribers, but it looks like all billion of them will be waiting a few years before they see 4G service. In a discussion aired on state TV a few days ago, Ministry of Industry and Information Technology leader, Miao Wei, said that China would most likely wait another 2 to 3 years to issue 4G licenses for LTE TDD networks. Wei stated that the country hopes to expand its current network of 220,000 TD-SCDMA base stations to 400,000, and then upgrade those units to LTE TDD before offering 4G licenses. He anticipates that process will take three years to complete. If that isn't one of the most offensive photos I've ever seen!... You guys are really looking to get yourselves In hot water with the Asian community. Not a good look Phonearena! So true...this picture is quite tasteless, even for phonearena. This nothing compare to what we have in my country. We have 2g only not even 3g thats what makes me wanna leave my country after graduation. Lol on the comments. The image used on that picture is one of the famous memes on this site called 9gag. 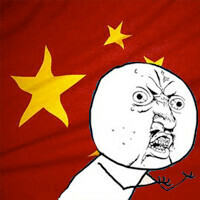 That image signifies those people that are quite baffled on why China does not want to license 4g. Lol. Get out of phonearena once in a while. At least you people can develop a healthy sense of humor. 3g was introduced in India only a year ago with himalayan prices and it was like people don give a crap about 3g. Now network providers are cutting down plan prices to attract people but its getting nowhere for them. So for india, that'll be like 2-3*2. Oh I have to say the Y U NO guy was a nice touch.